This morning I did a little work, then nipped out to run 8‐and‐a‐bit kilometres, mostly through Leigh Woods. I was particularly happy to have kept going all the way, including up the damn steep part where I normally rest at a picnic bench about halfway up to get my breath back for a while. It was a lovely day for running, not too hot, but nice a clear and non‐rainy, and it all went well. At the end of my run, I bumped into this little fella. 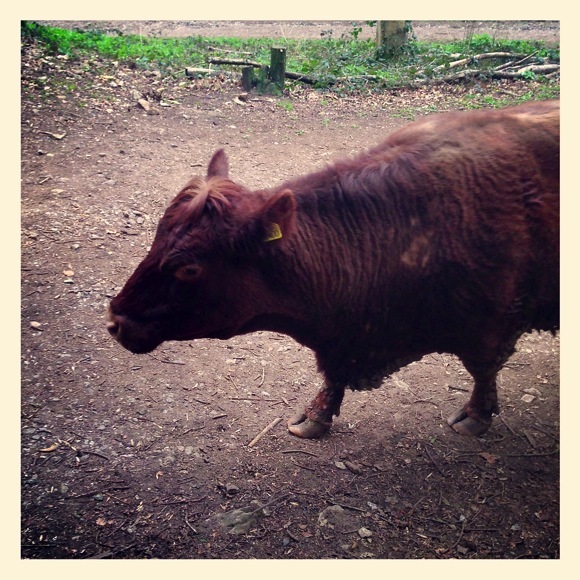 Apparently a Red Devon cow. Mooooo!